» Photosynthetically Active Radiation data taken with the Delta-T SunScan wand every 15 cm of 1m x 1m chamber flux and point frame plots as well as four remotely monitored canopies at the Toolik Field Station in AK, Summer 2012. Within-canopy PAR was measured with a Delta-T SunScan wand every 15 cm from the ground to above the canopy under both direct and diffuse light. The data includes all outputs from the SunScan wand: time of measurement, spread of PAR sensors, total irradiance, total diffuse light, and individual outputs of 64-PAR sensors on the SunScan wand. These measurements were taken for 1m x 1m chamber flux (n=14) and point frame (n=19) plots as well as sites four montitored remotely by PAR sensors located above, within, and below shrub canopies. 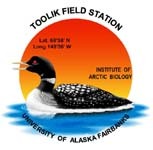 All plots were dominated either by tall Salix pulchra and Betula nana species and were located near the LTER shrub plots at Toolik Field Station , AK in the summer of 2012. The methods used to collect PAR at many heights within each canopy were the same used to collect LAI (see "SunScan_LAI_Data"), the primary difference being the settings in the Delta-T software. We measured PAR at 64 points within a 1-m horizontal profile using a DeltaT SunScan wand in conjuction with the BF3 sensor (Delta-T Devices Ltd, Burwell Cambridge, UK). The BF3 sensor recorded total irradiance and incident diffuse light simultaneously with the SunScan wand's 64-PAR readings evenly spaced along the 1m long wand. Readings were taken by inserting the SunScan wand as near to the ground as possible--typically ~5cm from the ground as the wand rested on top of moss--and then measured vertically every 15 cm with the last measurement being above the canopy. Measurements were taken from the side of the chamber or point frame opposite the sun at three locations for each height under both direct (ambient) and diffuse light conditions. In many cases the replicates at each height were differentiated by row (1-3, or occasionaly 3-8 which correspond to the point frame pins). Typically diffuse light conditions were achieved by shading only the shrub canopy with photographic diffuser panels (the BF3 sensor was not shaded). On occasion, measurements were taken during cloudy light conditions where the diffuse light fraction was greater than 0.7 and no diffuser panel was needed; on these occasions the direct and diffuse light estimates may have been taken in slightly different locations as they were taken at different times and the precise position of the SunScan wand could not be replicated exactly. * The measurements were taken near the end of the growing season when leaves were already beginning to senesce. * The weather conditions during the datalogger site measurements were almost uniform cloud cover; thus nearly all of the measurements were taken under "diffuse" light conditions (diffuse light fraction greater than 0.7). The measurements taken with "direct" light conditions were taken on partly cloudy days. * Five replicates (rather than three) were taken at each height within the canopy. Locations were chosen to be those immediately surrounding the datalogger sensors. CO2 and H2O fluxes were measured using a Licor 6400 photosynthesis system (Li-Cor Inc., Lincoln, Nebraska, USA) connected to a 1m x 1m plexiglass chamber in canopies dominated either by Salix pulchra or Betula nana shrub species. The height of the chamber varied depending on the height of the canopy being measured; chamber bases were constructed of PVC pipe to accomodate canopies with heights up to 125 cm. In addition to the plexiglass chamber, we also constructed a plexiglass "sleeve" that could extend the height of the rigid portion of the chamber by 0.25m. To set up each chamber, a location was chosen where the base would be level enough to ensure a complete seal with the plexiglass chamber and shrub branches could be moved either in or out of the chamber without creating large gaps in the canopy inside the chamber. Branches were included within the chamber if they were rooted within the chamber and excluded otherwise. Once the base was in place, we drove hollow PVC pipe legs into the permafrost and inserted an aluminum frame with foam campermount tape along the top edge for the plexiglass chamber and/or sleeve to rest upon, creating an airtight seal. The aluminum frame had taped to it semi-transparent, plastic skirt which extended to the ground (+30cm). We sealed the skirt to the tundra by weighting the skirt with heavy chains, pushing them firmly into the moss layer where possible and adding additional plastic materials as needed to ensure a good seal. We screwed the LiCor custom chamber head attachment over the holes drilled into the plexiglass chamber, again sealing with a rubber gasket. The air in the chamber was mixed using 4-8 small fans (depending on chamber height) powered by a 12v battery. At each plot we took measurements to create two light curves: one under direct light and one under diffuse light conditions. In order to determine the fraction of diffuse light, we used a DeltaT Beam Fraction Sensor (BF3, Delta-T Devices Ltd, Burwell Cambridge, UK) which quantifies the total irradianc and total diffuse light from which the diffuse light fraction (diffuse light/total light) can be calculated. For each day of flux measurements, the BF3 logged an instantaneous reading every 30-60 seconds set up on a leveled tripod at approximately 2 m above the ground. For the purpose of correlating the diffuse light fraction with each flux measurement, the LiCor 6400 and BF3 sensor were synchronized to read the same time (+/- 1 sec) at the start of each day. Different light levels for both diffuse and direct light curves were achieved by taking measurements under a variety of conditions: ambient light (no manipulation), successive shading levels (covering the chamber with 1-5 fine mesh net cloths), and intercepting direct light with photographic diffuser panels, as well as reflecting light into the chamber to increase the amount of diffuse light with white photographic panels. When the diffuser panels were used, they were carefully positioned to intercept all direct light that would otherwise enter the chamber. Whenwhite reflector panels were used, they were positioned on the side of the chamber opposite the sun and angled towards the chamber so as to increase the amount of diffuse light entering the chamber (these were used in conjuction with the diffuser panels). For these 'artificial' diffuse light measurements, we did not diffuse the BF3 sensor, thus the diffuse fraction calculations during these flux measurements do not represent the light conditions in the chamber. After field tests of using the diffuser and reflector panels, we determined that the panels effectively block all direct light, and thus we assume the diffuse light fraction is greater than 0.7 for these measurements. At each light level a flux measurement lasted 45 - 60 secs in total, with CO2 and H2O concentrations in the chamber recorded by the LiCor 6400 every 2 secs. After each measurement we lifted the chamber until CO2 and H2O concentrations had stabilized at ambient levels. We made an effort to obtain a wide range of flux measurements for light levels between 0-1600, and used whatever chamber light treatments were needed to achieve that based on the ambient light conditions. In addition to light measurements, we made at least three measurements in the dark for each day we took flux measurements. These were achieved by covering the chamber in an opaque tarpaulin cloth. These measurements represent the ecosystem respiration. After each light curve we determined chamber volume by taking depth measurements from the top of the chamber base to the ground. We measured the chamber base depth with 36 measurements made at regular 20cm intervals determined by placing a 1m x1m plastic frame with a 20cm x 20cm string grid on top of the base. The volume determined by these depth measurements (chamber surface area*average depth) was added to the volume of the plexiglass chamber (and sleeve, as needed) . The surface area of the inside of the 1 m x 1 m plexiglass chamber was 0.8836m2. We preferentially selected tall shrub canopies dominated either by Betula nana or Salix pulchra, that is canopies that were greater than 75 cm height. Care was taken to select fairly uniform canopies, that is avoiding the edge of a shrub stand or areas where the canopy had a large gaps, suggesting the area may have been disturbed. We used point frames constructed from a 1.1 m x 1.1 m aluminum square with holes in each corner to accomodate steel rod posts used as the legs of the point frame. In this way, the frame could rest upon the four leg posts that had been hammered into the ground and remain adjustable in each corner. The frame had a level on each side, and great care was taken to ensure that the frame was (a) unable to be pushed deeper into the ground and, (b) level on all four sides prior to taking measurements. These factors were important to the measurement to have accurate data regarding the distance from the frame and the overall height of each point sampled in the canopy. The aluminum frame had numbered, regularly spaced holes on two opposite sides in order to accomodate a metal bar that could be placed across the frame and locked into place. [These holes on the frame are the row numbers.] The bar that was placed across the frame similarly had numbered, evenly spaced holes in order to accomodate a pin--a long (100-200cm) metal rod with a diameter of ~3.175 mm. [The holes on this bar are the pin hole numbers.] Measurements were only ever taken from odd row numbers, and alternated even/odd pin hole numbers with each row; in this way, for every plot 25 evenly spaced locations were sampled covering an area of one square meter. The length of the pin was marked every half-centimeter so that the distance could be read easily. Measurements were made by lowering the pin through a pin hole and, once encountering a leaf or stem, recording the following: row#, pin hole#, hit#, and the species hit. If the object hit was not a leaf, the plant tissue was noted; the diameter of each stem hit was estimated in millimeters, and the length of every graminoid blade hit was recorded from the point at which it was hit to the tip. As the primary species of interest for this project were for a select number of species (B. nana, S. pulchra, S. glauca, S. reticulata, V. uliginosum, V. vitis, L. palustre), species that were not the target of interest were classified as functional groups--e.g. graminoid spp., forb, moss. The last pin-hit recorded for each pin hole was always at the "soil" which was considered to be the transition between the green and brown plant material, often in a mossy layer. These data can be used in conjunction with the other data collected from these same plots--leaf area index, light and A-Ci response curves of shoots taken at different segments of the canopy. Version 2: metadata updated to newer form (with sites sheet). CH April 2013.